By walking about on the floor, or by conducting a ‘bounce’ test, you will soon discover which floorboards are loose and which are secure. Loose floorboards are often the result of someone taking them up in the past and not putting them back properly or the nail holes having worn because they have been taken up and down several times. Unless you know exactly where pipes and electric cables are underneath floorboards, it is always good practice to use the existing nail holes rather than attempting to put nails in new positions, which might be directly above a cable or pipe. Sometimes, a loose floorboard can simply be secured by hammering the existing nail down into place (all protruding nails should be hammered down and punched just below the surface before using a floor sanding machine or before laying any type of floor covering). If the nail hole is obviously enlarged, a better answer is to remove the nail and put in a screw instead. Choose a size at least as long as the nail and of a diameter which will fill the nail hole – use a countersinking bit to make a recess for the screw head. Using an electric screwdriver will be much easier than putting the screws in by hand – especially if there are a lot to do. Sometimes a floorboard will have split or part of it will have broken off and the answer is to replace it – or at least part of it. If it is a short length already (perhaps cut out when new wiring was installed or central heating put in), you can replace the whole length; if it is only part of a board which is damaged, the existing board can be cut and only the damaged area replaced. To cut through an existing floorboard, you should raise it from one end (in this case the damaged end) using a bolster (wide) chisel to lever it up and inserting wedges under the side until it has ‘sprung’ over the joist where you intend to cut it (perhaps leaving the nails behind). Then you can use a floorboard saw to cut through the floorboard exactly in the middle of a joist (which should be visible, or which can be found by sliding a thin-bladed knife along the gap at the edge of the Board until it meets resistance). The floorboard saw has a curved edge so that you can saw through the board without damaging the boards on either side. The new length of floorboard is then cut to the length of the gap and fitted in place with new nails or screws. First, check that the new board is the same width and thickness as the board it is replacing, planing it down to size first if necessary. If the existing floorboard is tongued and grooved, you will need to cut along the gap on either side to remove the tongue before you do this. This can either be done with a floorboard saw or with a circular saw with the blade set to just less than the thickness of the floorboards. Before using any kind of saw, it is essential to check first with a pipe and cable detector for the presence of electric cables and/or central heating pipes running below the floorboards. Even where the floorboards are sound and securely fixed, you may still want to remove a section to inspect the underfloor space or in order to put in a new light fitting in the room below. The answer is to cut through the floorboard at an angle using a jigsaw. This is done at the edge of a joist which is located with a thin-bladed knife as described in the section opposite. Replacing Boards. For tongued-and-grooved boards you can use a joist and batten (furring strip) detector or go by the position of the nails which should be centrally located on the joist. With the common 50 mm (2 in) joists, the edge should be roughly 25 mm (1 in) either side of the nail. It is vital that you check for the presence of underfloor cables and/or pipes before cutting through a floorboard in this way. In order to start the jigsaw cut, first drill a hole at the edge of the floorboard over the edge of the joist and then cut through the floorboard at a 45° angle – a jigsaw can be set to cut at this angle. Make a similar cut at the other end of the piece you want to remove unless the first cut is close enough to the end for the whole piece to be lifted out. Unless the piece is between two adjacent joists (where it can simply be lifted out) the first jigsaw cut should enable you to lever up the board (after cutting any side tongues off with tongued-and-grooved board). Before replacing the board, cut a short length of 50 mm (2 in) square batten just wider than the floorboard and screw this to the side of the joist underneath. This then acts as a support for the length of floorboard removed – fit a second batten if you made a similar cut at the other end. In many older houses, you may find that your floorboards have significant gaps between them, which can allow a howling gale through if left unrepaired. Large gaps can be filled by hammering in thin strips of wood shaped to the size of the gap and tapered slightly so that they ‘wedge’ into place – a good answer if you intend sanding the floor down and leaving it with the natural look. The strips are coated with woodworking adhesive and hammered into place, using a second piece of wood to protect the strip. Plane or sand down once the glue has dried. 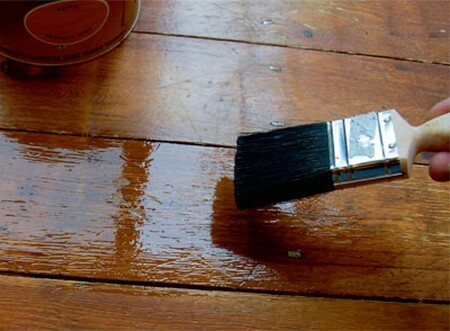 One alternative is to use a flexible wood filler, but not the rigid filler used for repairing walls which would not cope with the natural movement of the floorboards as the humidity levels change. Another option is to use papier mache. Made from strips of white paper and wallpaper paste, this is pushed into the gaps and allowed to dry. In all these cases, the various filling materials can be stained afterwards to match the surrounding wood -or better still the whole floor can be stained to a uniform colour. There are two reasons why you might want to insulate a suspended floor. With ground floors, it will be to stop heat escaping into the (cold) underfloor space; with upper floors, it will be to stop noise passing down through the floor. Insulating floors is not easy as it involves taking up the whole floor covering, so this is something you would not normally consider doing unless replacing the floorboards anyway. There are two types of insulation material you can use – blanket or batts. Insulating blanket is sold for use in lofts and can be used to insulate floors if netting (garden netting will do) is laid across the joists to provide a support for the insulation. Rigid insulation batts are sold mainly for insulating cavity walls but can be used for insulating floors if they are cut to the width between the joists and wedged into place. If joists have been overloaded or are too small for their span, they may have sagged causing the floor to become springy. This could also be caused by collapsed sleeper walls or by weakening of the joists (or the wallplates) as a result of rot or woodworm. In these cases, it may be necessary to replace or strengthen one or more joists. To replace a whole joist will almost certainly mean lifting all the floorboards since cutting out sections of the boards above a single joist will be almost as much work. In any case, it is likely that if one whole joist needs replacing, others will, too. On upper floors, you will also need to remove part or all of the ceiling below. The new joist can be put into the same joist hangers or holes in the wall as the old joist – when using holes, push the joist (cut to the correct length) as far as it will go into one hole, line up the end with the other hole and slide the joist back so it is resting on the wall in both holes (pack up with slate if necessary to bring the joist level with the other joists). Sometimes only part of a joist will need replacing – where, for example, a section has rotted. Hero, you cut out the damaged part of the old joist and bolt a new section on to the side of the old joist allowing a generous overlap. If it is the end of the joist which is being replaced, support the new section in a joist hanger. Joists can similarly be strengthened by bolting a new section on to the side without cutting out any of the old joist. If a joist has warped (twisted sideways), it might be possible to correct the warp by fitting new or additional ‘herringbone’ struts between the joists, first straightening the warp out with a car jack. The ends of the 50 x 25 mm (2 x 1 in) struts are angled to fit the joists and nailed in pairs between the joints at 1 m (3 ft) intervals. Drive the nails partway into the wood before putting the struts in position and nailing them down into the sides of the joist. Where a suspended timber floor has deteriorated badly, you might want to consider replacing all the floorboards -especially if you do not want to have any other floor covering. Otherwise, putting in sheet chipboard (particle board) flooring will be easier. 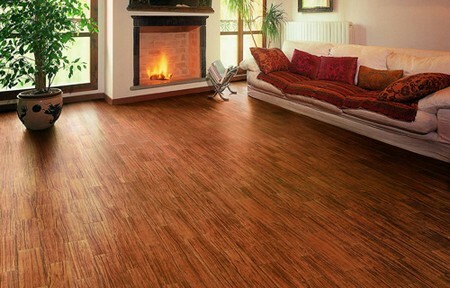 To fit new floorboards, the existing floorboards must first be removed, along with all the skirting boards (baseboards). Check the joists thoroughly for damage, strength and level – and repair, replace or strengthen as necessary. If insulation is being installed, do this before laying the new floorboards. When laying new floorboards it is most important to get each board tight up against its neighbour. You can buy special flooring clamps to do this: these are attached to a joist and tightening the clamp forces the board up tight. The floorboards should be cut to the length of the room less 20 mm , with any shorter lengths cut so that the free end is centred on a joist. Fit the first board with its edge 10 mm away from the wall and with its grooved edge (if using tongued-and-grooved boarding) facing the wall. Nail it in place with two nails into the centre of each joist, keeping well away from any pipes or cables laid in notches in the joists. Then lay the next five or six boards, using your floorboard clamp or wedges to force the whole group of boards up tight. To prevent damaging the tongue of the outside board, make the wedge which fits against it from a piece of the flooring so that it has a groove to go over the tongue. When you have wedged this group of boards, nail them all down and proceed with the next group. Continue like this until you get to the far side of the room and plane or saw the last board down so that it fits into the gap with 10 mm to spare (this gap and all the others will be covered by the skirting boards/ baseboards when they are replaced). If the groove of the last board cannot be fitted over the tongue of the penultimate board, cut off the bottom edge of the groove so that it will drop into place.